VoIP App For Apple iOS and Android devices…Make And Receive Calls Over Wi-Fi For As Little As 1c/min! We strive to make communication as efficient and inexpensive as possible for you, whether you’re calling across town, across the country or across the globe. We provide you with the best, least expensive, and easiest to use international cell phone service. Whether you are an occasional international traveler wanting to make sure you have a phone in case of an emergency, or a frequent corporate jet setter who needs to stay in touch with your clients at all times, we will have the best solution for you. We offer the opportunity to stay connected in over 200 countries while avoiding your regular mobile carrier’s high international roaming charges. If you are traveling only to Europe, we offer a special Europe & More SIM with Direct Dial calling from 40 countries and special low calling rates to the United States and Canada. If you are specifically looking for better Data rates on your smart phones, iPads and tablets we offer the OneSimCard Data & Roam SIM which features Internet Data coverage in 170+ countries, outstanding data packages and billing increments as low as 1 kB. It’s always a good idea to have an extra battery in case you run out of juice on the main one. Driving a car? Then you’ll need a cell phone car charger so you can charge on the go. Corporate Accounts for managing 5 or more employees. Reduce your organization’s international roaming expenses by at least 50%. OneSimCard’s custom Corporate Account system makes it simple for corporations, non-profits, travel agencies and tour operators to manage an unlimited number of travelers and their international roaming expenses. It’s not enough to save on communications – management has to be simple and flexible. International Communications are offered by OneSimCard®. 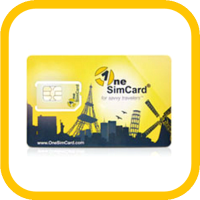 OneSimCard is a division of Belmont Telecom, Inc., a licensed U.S. interexchange carrier (IXC) providing telecommunications services since 1994. They strive to make communication as efficient and inexpensive as possible for you, whether you’re calling across town, across the country or across the globe.